Body Transformation: Body Fat Meltdown! Eric's body burnt fat for 84 days straight with a steady mix of dedication and dieting! See what it takes to go from 24 to 5 percent body fat! I went through a dirty bulk because I wanted to gain as much weight as possible, but it led me to gain lots of fat and minimal muscle. 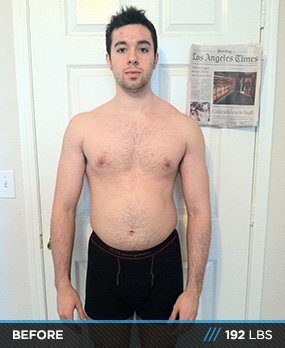 At the end of 2012, I saw the $100,000 Transformation Challenge on Bodybuilding.com and spent a month after the contest was announced debating whether or not to join. I was depressed that I gained so much body fat and wasn't sure I could make significant changes in 84 days. On top of my attitude, my doctor and chiropractor were against it because I damaged my rotator cuff and had mild scoliosis. A couple days before the final registration day, I stumbled upon a quote that reads: "A journey of a thousand miles begins with a single step" by Lao-Tzu. The quote changed my outlook and gave me the courage and motivation to sign up and transform my life. At the start of my 12-week journey, nobody cared what I did. After a couple weeks, people took notice of my dedication at the gym and my strict diet (I weighed everything out the exact gram). At week eight, everyone in the gym and my friends and family took notice. People in the gym stopped to ask how I lost so much weight and built muscle simultaneously. During the end of my transformation, when everyone saw my final picture, I had many people ask how I did it. It feels amazing to be an inspiration to others, especially when I was the one who looked for inspiration to start my transformation. I never realized the amount of people I could inspire. This journey helped me discover my passion and take steps to compete and get sponsored. I decided to get a degree in exercise physiology and nutritional science and hope to make a contribution to the supplement and fitness world. I accomplished my goals and found sources of motivation every day by staying active and informed on Bodybuilding.com. Seeing other transformations motivated me to be part of a great journey and experience. My motivation comes from quotes, inspirational stories, movies and speeches. There were times when motivation wasn't enough. There were times when I doubted myself and wanted to give up because it was demanding and I wanted the easy way out. Then I realized the easy way out will always be there. The main reason so many people fail is because it's demanding and easy to quit. In the end, I loved the pain and hard work it demanded. I gained dedication and commitment that transferred to my everyday life. I could've went back to my old way of living, but that only led to depression and low self-esteem. My true passion is bodybuilding. I fell in love with the physical and mental demands of the sport and the science and philosophy behind it. The mindset I carried every day in the gym transferred to my life outside the gym. I became more self-disciplined, my work ethic increased, my slothfulness vanished, and I felt more healthy and alive. Nutrition is a major part of your success. That means you must hit your diet harder than the gym. Consistency is key with nutrition. One of the most important tools I used to help me succeed was the meal planner. I tracked everything to the gram so I knew exactly how much I consumed and made sure to hit my macronutrient ratio every day. I tried to make meals as fun and tasteful as possible. Add lots of sodium-free seasonings and make different recipes with healthy ingredients. You're more likely to eat junk food if your meals taste like cardboard. The aspect that challenged me most during my three-month transformation was waking up at 6 a.m. every day for cardio (I hate cardio! ), but I had lots of fat to lose and it was necessary to reach my goals. I built a passion for bodybuilding and see myself competing soon. I'm currently going to school for exercise physiology and kinesiology to obtain my CSCS and CPT. 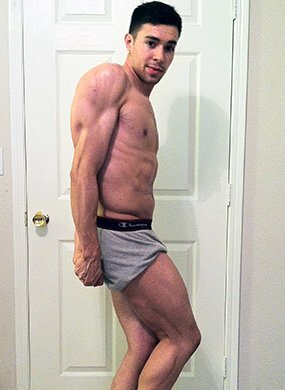 My short-term goals are to get noticed in the bodybuilding/fitness field through competing or other means. I would love to be sponsored by a supplement company and compete regularly. My long-term goals are to open a gym and supplement company, or get on board with a supplement company and improve it with the knowledge I gained. Trust yourself. Never doubt yourself or say you can't do it. Realize that failure is part of the recipe for success. Stay motivated, positive, and always keep the end goal in mind. Bodybuilding is a journey and nutrition is a lifestyle. Be grateful! Someone out there has it worse than you. Don't be hard on yourself. Bodybuilding.com has been amazing and gave me the information I need to perform exercises and supply me with supplements at a great price. I constantly stay active on the site and with the community.